There is a major misconception among many B2B industrial and manufacturing companies when it comes to digital and inbound marketing. They feel like they can’t use blogging and LinkedIn for B2B lead generation because they’re convinced that their target audience doesn’t spend time in those spaces. While some people use this weak argument to cover up their own insecurity, others see it as a massive opportunity to lead the way in the B2B industrial marketing space. Adam Robinson, Director of Marketing for Cerasis is one of those people. 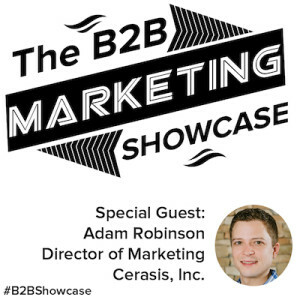 Adam joined me on the first installment of the B2B Marketing Showcase to share the strategy that has driven success at Cerasis. First things first, you need to get the infrastructure set up to support future digital marketing efforts. Things like a website, social media platforms, social media sharing tools, and a marketing automation system are all elements of the modern-day marketing infrastructure. When you’re building your marketing infrastructure, website design doesn’t matter. What really matters is the quality and value of your content. Getting the company story is really important. At Cerasis, Adam interviewed the company founders to hear the story first-hand and extract what makes the company different from the competition. He then went to each department and interviewed the department heads to boil down their area of responsibility in the company. Finally, he interviewed employees and dug into questions that customers were asking throughout the sales process. Then he went out and spoke with several large customers to really understand their needs and why they interacted with Cerasis. With all of this information at hand, Adam began building his digital marketing strategy. He identified his target audience, manufacturers, and distributors and defined what they care most about. He then looked at each department and the value that can be offered by Cerasis based on the needs and values of the customer. With this structure in place Adam built a content marketing plan based on 13 categories. The interviews that Adam conducted with customers, company founders, and employees gave him a lot of ideas for content, but there was something missing. To stay relevant with each industry, they needed to consume a lot of content. Using Feedly to curate relevant articles, Adam consumes 30-50 articles a day. That is hustle. With a deep knowledge of the target personas and with a steady stream of relevant content flowing through Feedly, Adam creates and posts one original blog post per day to the Cerasis blog. In addition to original blog posts, Adam seeks out bloggers for guest posts. Check out Matt Cutts blog and video – don’t do guest blogging for the purpose for links. Care more about brand awareness and relevance because spammy practices will be penalized in the long term. Cerasis Content Marketing Strategy: Be a thought leader, write about things that are of value to our target audience, and don’t be too salesy. Today’s consumer is sharp, educated, and they’re out there looking for information. They are already down your sales funnel further than you think before they become a lead. Segmenting your marketing database makes your communication more personalized and relevant. Think about your form and offer fields that qualify your leads. You don’t want to waste time talking to unqualified leads. The qualifying question that Adam uses on their forms is Do you ship freight in North America? Their content can help people around the world, but their services can only help people in North America. They take the best content based on analytics and put that content into their email newsletter. They segment their database based on what they will find most relevant. Content becomes more scalable when you’re blogging every day. Everything from webinars to email newsletters come easier when you’re repurposing the content you have already created. When it comes to generating leads through LinkedIn, distribution is only the first step. You need good tools to distribute content into groups, but once it is there you need to be responding to comments and engaging in discussion. When you’re engaging in discussions and you’re going back and forth with people, they’re going to be more likely to read the articles that you’re posting. If a group turns out to be no good, don’t waste your time there. Evaluate your groups and if it isn’t living up to expectation, leave. You can only join 50 groups, so make each one count. Allow other people to make you smart and use discussions as an opportunity to be educated by industry peers. These discussions are also great material for blog posts. By mentioning discussions, people, and company names in your blog post, you get people super engaged with your content. This gives you another opportunity to build a relationship with them. Make the people a part of your content, too! Adam shared some great tips and strategies that can help all of us make better marketing. Take a second to reach out on Twitter and thank Adam for taking the time to share with us. If you’re interested in learning more about creating content for your organization, then checkout The Ultimate guide to Epic Content for Boring Industries. This free guide is filled with tips, tricks, and tactics that will help you build a digital marketing strategy like Adam has done at Cerasis. Don’t forget, it takes hustle!